General admission tickets ($25) are on sale now at all participants. It’s a sell-out every year so stop in today to buy your tickets before they’re gone. Losurdo Brothers Bakery and Deli 410 2nd St.
Best in class eateries will showcase the best mozzarella in the area. Get ready to break your New Year’s resolution with the marvelous, milky tasty delight of mozzarella – and lots of it! Featuring five of the city’s most renowned and much-loved mozzarella eateries, this annual event is fun for all the senses and all ages. 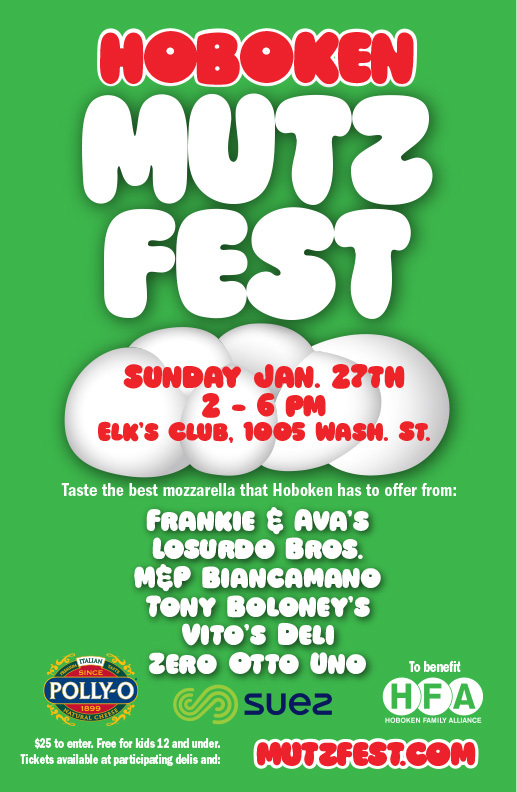 Only Hoboken’s best mutz-makers are invited to participate in this annual classic that brings together local small businesses and community. This event is organized by the Hoboken Family Alliance and proceeds from the event benefit its numerous local community initiatives. Enjoy a fun, festive, day that spans generations with entertainment by McGill & Co, a Cannoli Eating Contest, Frank Sinatra Sing-A-Long and ESPN. We thank our event sponsor Polly-O, which provides the prized curd ingredient to make marvelous mozzarella, for supporting this unique local event. Also thanks to SmallBizMakeover.com Website Design & Online Marketing of Hoboken for upgrading our website.